Tim Goldstein will be speaking as part of an amazing academic and corporate panel. The SIOP Annual Conference is April 4 - 6, 2019. Tim's panel will be presenting late morning on the 6th. 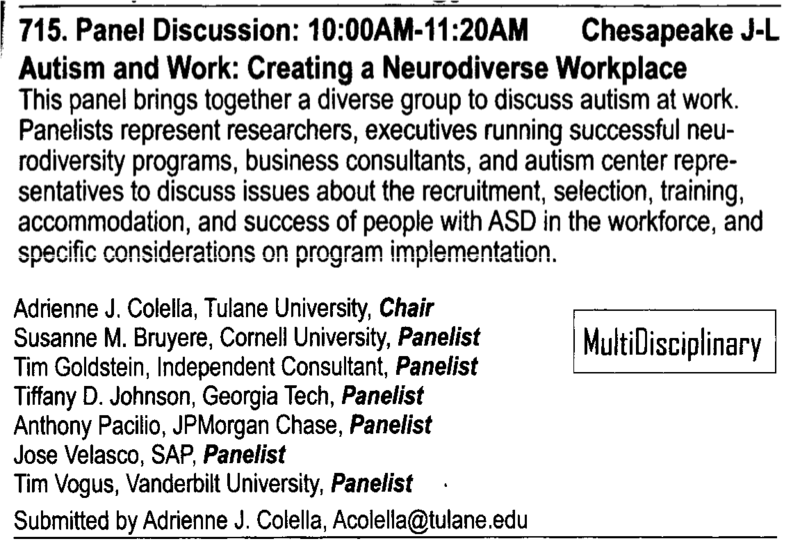 This panel brings together a diverse group to discuss autism at work. Panelists represent researchers, executives running successful neurodiversity programs, business consultants, and autism center representatives to discuss issues about the recruitment, selection, training, accommodation, and success of people with ASD in the workforce, and specific considerations on program implementation. Susanne M. Bruyère, Ph.D., CRC, Professor of Disability Studies and Director of the K. Lisa Yang and Hock E. Tan Institute on Employment and Disability at the Cornell University. Dr. Bruyère is focused on workplace inclusive policies and practices conducted in companies with proactive hiring initiatives for persons who are on the Autism Spectrum. She has worked with various companies to develop such initiatives. Adrienne Colella, Ph.D. (chair & moderator), McFarland Distinguished Professor of Business, AB Freeman School of Business, Tulane University. Dr. Colella has written extensively on disability issues at work. Tim Goldstein, Independent Consultant, Neurodiverse Communications Specialist. Tim was diagnosed with Asperger’s syndrome only a few years ago at age 54. He has consulted with numerous companies (e.g., Microsoft, Macy’s) on issues ranging from initial discovery of the company’s needs around neurodiversity and autistic workers through design and implementation of a strategy to recruit and support new and existing neurodiverse workers. Using his “Cloud Neurodiversity” idea, Tim helps the business world understand the Spock-like logical approach of the technical world. He is the author of “Geeks Guide to Interviews: 15 Critical Items for the Technical Type”. Tiffany Johnson, Ph.D., Assistant Professor of Organizational Behavior at Scheller College of Business at Georgia Tech. Dr. Johnson has conducted and published a great deal of research on the intersection of stigma and autism in the workplace. Her research includes individuals with ASD and related disabilities, as well as their colleagues, supervisors, and job coaches. Anthony Pacilio, Vice President, Autism at Work, JPMorgan Chase. JPMC’s Autism at Work Program aims to hire qualified individuals with Autism Spectrum Condition (ASC) into meaningful roles across the firm. What began as a pilot in 2015 with four employees, in one location and one role, has now grown to over 100 employees in 7 countries and over 20 different roles throughout the firm. Their goal is to hire 300 individuals on the spectrum by 2020. Jose Velasco, VP Products and Innovation, Head, Autism at Work, SAP. In 2013, SAP launched its Autism at Work program, which is aimed at recruiting and hiring adults on the autism spectrum. The program has been such a success, SAP is currently working to expand it, with the goal of having 1 percent of its total workforce -- approximately 650 people -- fall on the spectrum by 2020. Timothy J. Vogus, Ph.D. Brownlee O. Currey, Jr., Professor of Management Owen Graduate School of Management Vanderbilt University. Dr. Vogus is a member of the Vanderbilt Initiative for Autism, Innovation, and the Workforce which represents a collaboration of Vanderbilt engineers, scientists, disabilities researchers, and business scholars, together with major employers in Nashville and leading autism-related organizations nationally. The Initiative is devoted to: developing a strengths-based — as opposed to deficit-based — understanding of neuro-diverse capabilities; modeling of novel employment arrangements, management trainings, and workplace practices that fully utilize these capabilities to spur innovation; inventing new technologies that enable autistic and other neuro-diverse individuals to succeed in employment and achieve their full potential; and documenting and disseminating an all-hands community-based approach to enhance quality of life for autistic individuals through meaningful employment.